The first residents in the ultra-luxury Prive at Island Estates condominium in Aventura are moving in as legal battles between the developer and neighbors persist. Residents of the ultra-luxury Prive at Island Estates in Aventura have started to settle in just as their neighbors won a partial victory in ongoing litigation with the developer. The Third District Court of Appeal for the most part agreed with a trial court that dismissed the developer’s suit against some nearby residents. But the panel Wednesday reversed the lower court on one point: the developer’s allegation that four residents made false and malicious statements about the developer’s right to build should not have been dismissed. Prive Developers LLC, a partnership between Gary Cohen and BH3, developed the twin-tower, 160-unit complex with panoramic views of Dumfoundling Bay. One of the 16-story towers was ready for occupancy in December and the other this month. It’s the only development on the 8-acre private North Island, which can be reached by bridge from South Island, an enclave of single-family homes. Prive Developers principal Greg Freedman, co-founder of BH3, said the team is happy with the opinion, specifically referring to reinstatement of the slander claims. “It provides us with the option, if we wish to pursue it, to pursue those individuals for slander of title and malicious statements they made to the public in an effort to hurt our project,” Freedman said. 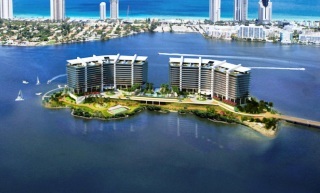 Prive at Island Estates, a two-tower condominium project under construction on an 8-acre private island in Aventura. Of the many disputes over the project, this one started in 2015 when developers sued some South Island owners about an underlying easement obtained for sidewalk construction on South Island. Residents contested the work in court. The developer turned around and sued the residents, seeking more than $30 million in damages and arguing they broke the easement agreement when they disputed the sidewalk and the developer’s right to build the project. Miami-Dade Circuit Judge Jerald Bagley in 2016 dismissed the developer’s breach of covenant, specific performance of covenant and breach of the duty of good faith and fair dealings counts against the residents. Writing for a unanimous appellate panel, Judge Kevin Emas agreed with that dismissal, ruling the South Island owners had the right to dispute the sidewalk construction and didn’t breach the agreement because the homeowner association rather than individual owners signed the agreement. Judges Richard Suarez and Thomas Logue concurred. “The Third District’s opinion … found that the homeowners, at least my clients, could not have breached the EODA (easement, operating and development agreement) because they were not parties to it,” said Caryn Bellus, a Kubicki Draper shareholder in Miami who represents some of the 18 South Island homeowners who were sued. The developer also alleged four South Island residents tried to stop the North Island project by maliciously spreading information that it wouldn’t be built and Cohen didn’t have the right to build it. Among the residents sued for slander of title is Eric Feder. He is vice chairman of real estate investment and asset management company Rialto Capital Management, a subsidiary of Miami-based homebuilder Lennar Corp. When the developer introduced Prive, Feder “greeted guests on their way to the North Island with a homemade sign, indicating that the project would not be completed, and he told some guests, whom he stopped, that Cohen lacked the right to build the high-rise condominium that the event itself promoted,” according to the complaint. Feder also approached agents for Turnberry International Realty, which sold Prive units, at the Aventura Mall and told them that they should stop selling Prive units “as it will never be built while he is alive,” according to the developer’s complaint. Conroy Simberg partner Dale Friedman, who represents three of the four residents including Feder, said evidence will clear Feder and her other clients. “You’ll actually have to be very specific when you are dealing with slander of title as to what was said. … I do not believe there is any evidence to support slander of title. … I think the language of the court is inviting us to get the facts and come back on summary judgment, which is what I truly intend to do,” Friedman said. The developers also sued Feder alleging he interfered with a settlement agreement between the developer and the Williams Island Property Owners Association. The trial court ruled that tortious interference claim was barred by litigation privilege, and the appeals court agreed. The development team now is pursuing damages against Williams Island and, once that trial is done, it will focus on the Third DCA ruling, Freedman said. Prive at Island Estates is at least 75 percent sold with units starting at $2.2 million. Amenities include a residents-only restaurant by the pool, tennis courts, pier, private marina with slips for up to 135-foot yachts, pet-grooming salon and car wash service.